The Opening of our Exhibition “Arabic Graphics: the work of Tarek Atrissi in Exhibition” took place on the 2nd of May 2008 – in the presence of the Lebanese ambassador of the Netherlands Zaydan El Sagir- and will be on display through the summer at the The Delevante Foundation gallery in Amsterdam. The initial scheduled end of the exhibition on June 22nd has been extended until the 31st of August. For us at Tarek Atrissi Design, this marked the end of a lot of work and preparations for the exhibition, accompanied with the launch of our new website, but was certainly a great recognition to have in The Netherlands; and a chance to review and organize a lot of our work developed over the last 10 years. The opening of the Exhibition was as well a memorable reunion of friends, family, colleagues, clients, and people who has supported me as a designer and supported us as a design studio, in an ongoing exciting entrepreneurial business experience that started back in 2000. 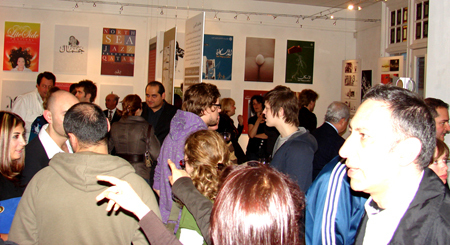 From the Opening of “Arabic Graphics: The work of Tarek Atrissi in Exhibition”. Seeing a “3 Dimensional portfolio space” is definitely exciting on its own; yet the pre-preparation process phase was in itself even more exciting. 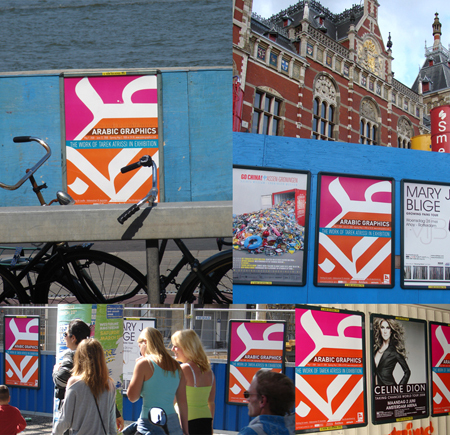 We have spent a lot of time exploring design possibilities for the exhibition poster and promotional material- and eventually were delighted to see the poster across the streets of Amsterdam: Adding an Arabic fingerprint across the city; and contrasting in its bright colors and simple design treatment with the rest of the posters on display at the time. 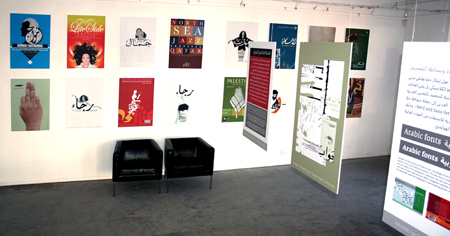 The Delevante Gallery which hosted the Exhibition- shown above the Poster design mural and some of the Arabic Typography and Type Design showcased work. Though usually I consider myself a good speaker, I have been taken by surprise to add few words to the introduction speech and – probably because of the very personal aspect of this event- failed to articulate well and thank many of the people who helped in the exhibition. 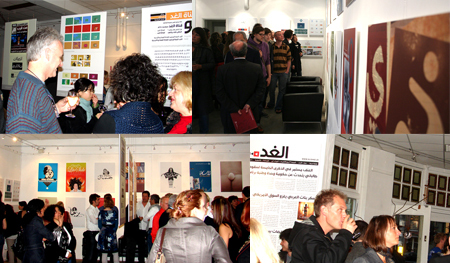 Paul Klok, Azza Alameddine and Diana Hawatmeh for putting so much efforts the last two month before the Expo; Fred van Eijk for a wonderful introduction speech; The entire Delevante team for believing all the way in their cultural mission; The sponsors of the exhibition (Gemeente Amsterdam, ArteGanza, Eutopia, Stichting Doen); All the friends and colleagues that came a long way to be part of the show; As well as Annahar Newspaper, for reviewing our work so positively across the years. It was a chance to celebrate our designs, yet most importantly, an occasion to look at the bigger picture of the work we are doing and have been producing, and reflecting on the future of our design practice.